Despite it being one of my favourite pastimes, I find sleeping a really tricky thing to do. For me to get a fully rejuvenating night's sleep, I need a number of variables to line up. Temperature, light, and noise levels are the basics. If I'm too hot, I'm restless; if I'm too cold, I'm grumpy; if there's too much noise, I move rooms almost immediately. Additional variations include comfort, hydration levels, if I'm relaxed enough, when I last had caffeine etc, etc. Luckily, I can control most of these things while walking along a careful line to try not to drive my husband mad with my many demands! The bizarre and worrying warm temperatures of last month brought comfort and temperature to the forefront of my mind. A couple of degrees warmer at night is enough for me to switch from my snuggly winter pyjamas to summer ones and I remembered that I had been promising myself another pair of Fifi pyjamas since the middle of last spring. I basically live in my Summer Rose and Retro Swirl versions throughout the warmer months where they are in a constant cycle of wear, wash, dry, wear... Having a third pair would take the pressure off. I wanted a slightly more sumptuous and whimsical pair this time. Laying patiently in my stash was a cut of Isa Liberty Lawn I picked up in one of their sales. The fabric was chosen by an academic who specialises in Carroll's 'Alice's Adventures in Wonderland' and at the time was exploring Alice in relation to fashion and dress. The design was selected because the crescent shapes evoke some of the elements of Wonderland: the Alice Band, the Cheshire Cat's toothy grin, and the dots apparently suggest the shifting shapes and patterns beneath the surface. The dreamlike sense the design rouses makes it perfect for a pair of pyjamas. Plus, I'll take any opportunity I can to use Liberty lawn! This pair are the same size as my others (graded between sizes 5 to 6 to 4) and I made no changes to how I constructed them. As you might image the lawn was a dream to stitch (not sorry), going through the machine like a hot knife through butter. I savoured every French seam and got a lot of joy from the insides beginning to look as neat as the outside. Not having any inclination to make my own, I used bright yellow ready made bias tape. As the yellow is so bright, I used it sparingly at the straps and the top of the camisole. I surprised myself with my colour choice as I steer clear of yellow and orange due their frequent ability to make me look ill, although the small amount at the front seems to work well here. Looking back, I would have preferred slightly narrower tape as the width takes something away from the delicate style of the camisole. I've worn these a couple of times and they live up expectations. The soft supple cotton drapes beautifully which is ideal for the camisole and feels indulgent to wear. I've had a good couple of nights sleep. While I can't say for certain that this has anything to do with these pyjamas, I'm willing to give them the credit. Last August, Adam and I spent an afternoon shopping in Toronto as our honeymoon drew to a close. Obviously I chose the local fabric stores over the mainstream chains in the hope of bringing home a couple of souvenir pieces. We visited Affordable Textiles on Queen St W. It didn't disappoint with fabric stacked from floor to ceiling. While I went hunting for viscose, Adam paused at the front of the shop and called me back to look at an interesting pattern full of deep, slightly muted colours which would make a cool statement skirt. Without deliberating, I purchased two metres and popped it into my suitcase. I then spent six months dreaming of the finished skirt frequently worrying it wouldn't live up to the image in my head. While it hasn't quite come out as planned, it hasn't disappointed and I bloody love it. A print like this is demanding. It needs to be disturbed as little as possible with careful thought on pattern placement. To make the most of the print's size, I chose the classic A-line skirt and went back to an old trusted pattern, Colette's Ginger Skirt. This pattern fits me like a glove due to it's distinguishing feature of providing shaping through a gently curved centre front seam rather than darts. However, I couldn't bring myself to slice up the centre of the print and made my only pattern modification by cutting the front on the fold. This change seems to have made very little difference to overall fit as it still manages to hug my lower stomach smoothly and comfortably. I knew pattern matching would be required and chose to focus on ensuring the front and back matched, leaving the side seams to fend for themselves while hoping the busy print would camouflage the seams. Despite taking a long time considering pattern placement and slicing the waistband into more pieces than required to keep a continuous pattern, I was only partially successful in getting everything to line up. The pattern flows best at the front where the waistband meets the skirt and I don't think the centre front seam is noticeable. Basting the centre back revealed two options: a very obvious failed attempt at matching or mirroring the print by reducing the seam allowance a little. I chose the latter on the basis that it didn't irritate me as much. While I didn't think about the side seams, the pattern is only a few centimetres off and looks much better than it could have. When choosing the fabric in Toronto, I couldn't fully identify it. Its weight suggested a medium weight cotton but it was very stiff and had a sheen to it with an unusual texture suggesting it had a coating of some kind. I was advised that it was a home furnishing cotton which had been treated to make it flame resistant. It was possible to wash it but that would dramatically reduce the effectiveness of the treatment. I had no idea how the print would look after washing but it seemed a risk worth taking. The cotton softened a lot but kept some of the sheen and the texture. I suspect that it will continue to soften with wear but the print seems very stable and unlikely to be affected by further washing. I have no idea if it is related to the treatment or if its just the weave, but the back of the cotton is rougher than normal and doesn't feel good against the skin. To wear this skirt frequently, a lining was definitely needed. I paired the cotton with a gorgeous deep jade bemberg from my stash which is impossible to photograph correctly. The lining is attached only at the waistband. To get a professional finish on the inside, I inserted the invisible zip using my tried and trusted technique that removes any hand stitching. I enjoyed the moment when the zip went in perfectly on the cotton at the first attempt with seams and print lining up beautifully - something that rarely happens. I heavily clipped the inside to allow the waistband corners to look as sharp as possible, helped substantially by the under stitching along the waistband. To create a flawless hem, I diverted from my original plan and hand stitched it into place. I had wanted to machine stitch it but didn't have a thread would blend into the print well enough - the black under stitching on the inside waistband is quite noticeable. The hem is overlocked, turned up by a centimetre and secured into place with catch stitch. I adore this skirt. While muted, the colours and print are brightening up the dull grey days we are still experiencing. The style fits perfectly with my preferred winter silhouette of a skirt and top with tights and boots. It's very well made when I compare it to my other earlier Ginger skirts and should stand the test of time. I get a little confidence boost everything I look at the skirt and wear it. I don't think you can ask for more in a make. Today's project started with the fabric. In early December, I saw some beautiful Winnie the Pooh fabrics by Visage Textiles in John Lewis and knew immediately that I had to purchase them. The set features five designs and the questions were which project, which combination of cottons and for whom would I make something for. My mum was the obvious candidate as she's a big Disney fan and luckily she had mentioned she needed a new kindle case. I went back to the shop and spent a very long time considering the designs. I eventually settled on the pale green one featuring Winnie the Pooh, Piglet, Eeyore, and Tigger engaging in a number of activities. This would be the outer cover. I chose the white one featuring only Pooh, content with his honeypot and balloons to act as the complementary lining. I purchased half a metre of both. The cotton is of excellent quality and supple when washed. I played a little loose with the size. After making a card template of the kindle's size, I added a few centimetres around it. I then double the length, added seam allowance and an additional centimetre to allow for the centre fold and for turning the cover through the right side. Two layers of stiff sew in interfacing provide the cover's structure while a single layer of fleece cut from an old dressing gown provides some cushioning. To lift the cover's colours and to add a nice detail, I chose a sage green piping made from thin cord and bought bias binding. The elastic is a sturdy sports elastic with a light blue zigzag as it complemented the fabric more than plain white which looked too stark. Construction was fairly simple. I basted the piping to the outer green cotton and then the elastic to the outer edges. The various fabrics were then layered: white cotton lining right side up, green cotton right side down, interfacing, fleece, interfacing. As it resembled a giant fabric sandwich, wonder clips kept everything in place. I used a denim needle to work through the thick layers and left a large gap in the stitching at the bottom away from the centre fold which was slip stitched into place after turning. Stitching smooth curves was tricky due to the number of layers. Turning through was the hardest part as I wanted to minimise the number of creases in the interfacing and not tear the more delicate cotton. The inside elastics were anchored very securely by hand. Thankfully the kindle fits in perfectly and sits safely in the elastic holds. I'm fond of this project as the fabric are playful, uplifting, and fun - the perfect background for escaping into a good novel. Favouring slower paced creative endeavours at the back end of last year, I continued with my very early experimentation with embroidery. After being blown away by the works of art in the thread painting community on Instagram, I wanted to give it a go to see if I could pull it off. I wasn't fully confident. The artistic skills of drawing, painting, and shading have always eluded me due to a lack of patience in getting a good result and the seemingly never ending practice it takes. Hence the focus on sewing and cross stitch where you can often see results and improvement quickly. I chose the Pansies pattern by Emillie Ferris. I was drawn to the individual flowers which allow you to complete small sections at a time but with a good sense of progress as you tick off the flowers. And who could resist the bright colours? The pattern states that while some embroidery experience would be beneficial, it isn't necessary. From trying this pattern alone, I agree. Emillie's instructions are brilliant. The PDF file contains pages of detailed instructions on how to trace the pattern onto fabric, how to create long and short stitch, the best areas to begin stitching and why, which colours to use where and each step is accompanied by a full colour in progress picture. In addition, there are useful tips on how to achieve a neat blended finish when you add the next row of stitching. The level of detail provided is reassuring as you start out and as you progress to larger and more complicated pansies. Long and short stitch did not come naturally to me. I struggled to get a natural, realistic effect when blending colours and achieving smooth curves to reflect real life petals boggled me. The advice to pencil in some stitching guidelines helped a little. Determined to see what the final result would be, I persevered and eventually it became easier. I discovered that if I could get the stitch angles right around the edges of the petals as I covered the split stitch outlines, I would achieve a better curve. If I stopped worrying about filling the space properly as I went along the line, I could get a more natural look by filling the gaps later. If you look closely, you can see the improvement in my stitching play out in the flowers. Clinging to the instructions to guide me, the lower flowers were completed first before moving anti-clockwise finishing with the yellow and purple pansy at the top left. The earlier flowers are a little lumpy as the thread twisted and overlapped more than the later flowers. They are also more uneven in shape as I didn't get as sharp a line over the split stitch outline and they have more gaps. Despite my lack of confidence and ability in shading, I found stitching the flower faces where the darker colours blend into the lighter background to be the most satisfying. Through the placement of some carefully positioned longer stitches the flower came together. I enjoyed experimenting with these longer stitches to see the different effects that could be achieved. Again, I think you can see the improvements in blending in the pansies stitched towards the end of the piece. I chose to stitch onto an old cotton bed sheet which sounded just like a tambourine when pulled taught in the hoop. The threads are DMC of varying qualities. The lighter yellows twisted more than the others - I originally thought it was my stitching at the beginning but it continued as the piece went on. I had no issues with any of the other colours. While it isn't perfect, I'm proud of this starter piece. I love how you can improvement as I practised and its shortcomings in all their glory. The imperfections are what makes a handmade piece special. The pansies will shortly be hung in our bedroom with the completed cherry blossom hoop and my next project - the Painted Lady Butterfly also by Emillie Ferris. If you're interested to see how this is coming along, I'm sharing regular updates on Insta stories. Every now and then you come across a make that is simultaneously super exciting and slightly crazy. For years I have wanted to make something personal for Adam, but the right project eluded me. One magical day in October, while browsing Etsy for inspiration, I come across a cross stitch pattern for a stocking featuring the cast of the Nightmare Before Christmas - a favourite film for Adam. It was perfect. But could something this detailed be delivered in time? I did a quick calculation: a PDF pattern + some DMC threads at home to begin + Aida bought on the way home that evening = might *just* be possible. The trickiest part would be stitching this in secret but I could utilise the couple of hours that I have on my own before Adam gets home in the evening and, if needs be, put in a couple of early mornings. I purchased the pattern from ExclusiveXPatterns who have some great cross stitch designs. As the design is aimed at those with some experience in counted cross stitch, the PDF download is very basic - the pattern prints fine but the rest of the files containing the colour key, instructions, and letter chart are not well formatted for easy printing on A4 nor do they provide a photo of the finished product. However, you have everything you need to get going. The size of the stocking is provided for 14 count Aida. I chose to use 16 count as I felt the smaller sized stitches would bring out the intense detail more. The design calls for 29 different colours, with some used sparingly for highlight details, and most are quite muted in various hues of black, grey, blue and brown. Progress ebbed and flowed over the eleven weeks it took for me to complete this. I chose to work methodically: starting on the left hand side and working across to the right, one full page at a time. The first two pages were the easiest due to the large blocks of colour which are quick to count out and to complete as it didn't require continuous rethreading of the needle. The pattern is entirely made of full stitches which also helps to speed things up. I enjoyed the fact the main man, Jack Skellington, started to come to life on the second page. The third and fourth pages were the opposite - they contained a huge amount of detail and very quickly became frustrating as they are made up of small to minute blocks of colour separated by many other small blocks of different colours. It was very easy to miss a couple of stitches and it felt like I found a skipped stitch every time I looked at it. Due to the level of detail here and my constant close inspection to find holes, I found it very difficult to see the design taking shape until I reviewed the in progress photos I had been periodically taking. Suddenly I understood how the intricate changing of colours had brought Jack's hands to life. By the end of November, I was finally able to move on to the bottom of the stocking and complete pages five to seven. This section came together fairly quickly as the design didn't take up a full page and larger blocks of colour returned for speedier stitching. I greatly enjoyed the palette change with the focus on much brighter colours. Before I knew it Santa Claus had made an appearance and I was on the home straight. I finally finished the stitching on 15th December after putting in more 5.30am mornings than I care to admit. In keeping with the colour theme, the stocking is mounted on deep purple cotton. Due to the size of the stocking, I wanted to keep as much of the stitching on show as possible and lost only 5mm when stitching it to the cotton. It is finished with a brown ribbon for hanging. My only, tiny regret in this project is that I completed it on cream Aida as this was all I could get at the time. Surprisingly, it hasn't shown through the dark stitches but it is visible in places at the edges where it is stitched to the cotton. After putting in so much time and effort, I became slightly anxious that this was a risky gift. On Christmas morning, I realised I needn't had worried as Adam loved it. "It seems such a shame that it will be put away for eleven months of the year." That's the best response I could have hoped for. While it may have been quiet over here for a while, the last few weeks of 2018 saw an almost endless stream of creative activity as I completed seven Christmas presents and made a large number of fabric wrapping bags in an attempt to make gift giving a little more sustainable. It was wonderful to get lost in fabric, felt, thread and patterns again. I'll be sharing most of them here but may mix up the timing a little, focussing for now on the most festive makes. Felt is a popular fabric at Christmas and I admire decorations made with it. I had been longing to attempt something more complex than small penguins that hang from the tree and making a stocking for Adam's four year old godson seemed to be the prefect way forward. As I'm not that experienced in using felt, I knew I wanted a kit and got slightly lost down the rabbit hole. Have you seen some of the kits? They are incredible! We wanted something playful that would last throughout his childhood and chose Father Christmas as the main character. Having seen a few previous versions, I selected Dimensions Felt Appliqué Sequin Santa Christmas Stocking and purchased it from Sew Essential. The kit contains everything you need except the stuffing. The instructions detail the steps to complete the stocking (think of it as painting by numbers for felt) as well as diagrams on the various hand stitches you will need to master as the stocking is made completely by hand. I would recommend reading through the full instructions before getting going. On the advice of many bloggers who had previously created a stocking, I did follow the instructions but there were a few steps where I mixed up the order as it made more sense to me and seemed easier to add details without the large stuffed areas getting in the way. All of the pieces come numbered and printed onto the right colour felt for cutting out. You have the choice of cutting them out at the beginning or as you go along. I chose the latter as the numbers are on the outside of each piece and I would lose track quickly of which piece was which number. In addition, cutting them as needed meant they remained neat and didn't accidentally stretch or become warped. I loved creating this. It becomes personal right from the start which is where you add the name of the recipient and a long line of sequins. I diverged from the original stitch as I just couldn't get it to work around the curves. I've forgotten the name of the stitch but essentially you make a stitch and pull the needle up mid way through that stitch on a particular side, make a new stitch and repeat. The end result looks like twisted rope. I used split stitch instead which gave me much better control in creating smooth curves. Father Christmas comes to life fairly quickly in stages: hat, face, and beard. There's a surprising amount of work in the hat and the cheeks require careful long stitches but the majority of the time is spent on the beard. I didn't make this stage easy for myself. Compared to the finished photo in the kit, I overstuffed all parts that required it to bring Father Christmas more to life. The consequence was the stitching lines in the beard were harder to complete and required careful work to ensure the tension on the thread wasn't too much. The part I found the hardest was keeping the points of the smaller stars sharp and in place while I stitched. Adding the sequins was especially satisfying and quick to do once you got into the rhythm. Another consequence of overstuffing was the front of the stocking rippled with the stitching lines. In addition, you end up with a lot of thread on the back side. To prolong the life of the stocking and to ensure that no presents would accidentally pull a piece of thread, I added a protective layer of felt to the front before adding the back. Stitching through three layers of felt was a breeze compared to the beard! I didn't clock watch, I estimate the entire project took about 22-24 hours to complete. I thoroughly enjoyed every moment of it - it was one of those projects that you just couldn't wait to pick up again. I'm currently enjoying a few more days of leave before I go back to work and routine. I'm spending this time quietly, taking stock before other activities demand my attention. As is natural with endings and new beginnings, reflection creeps in. I've been pondering what type of year you were. Frankly, you were intense. We underwent a huge amount of change. Together we finally explored and tackled issues which I felt were continuing to adversely affect my quality of life. You helped me to face up to deep seated fears and truths I had been avoiding for years. You left me on my knees, drained to the verge of exhaustion. Pressing pause on my goals, creating, and even exercising, gave me much needed space and took away distractions. It led to revelations, letting go, and rediscovery. I feel lighter, more content, more resilient, able to sit much more comfortably with myself. The impact of these changes have yet to be fully revealed but I'm seeing and experiencing a positive change in my relationships, work, my approach to life, and my self worth. Self-detrimental behaviours and habits are beginning to disappear. While you and I will be the only ones to know the details, it felt important to mark this publicly as I have previously done. I'm enormously grateful for everything you have given me throughout the year. A special mention and thank you to Adam whose unwavering support and space helped to make this possible. It means the world to me. So farewell, friend, and thank you. This summer, Adam and I were fortunate enough to finally take our honeymoon (about 15 months late!) While we had planned to spend the majority of the time sightseeing and exploring stunning scenery and cities, I knew that I would get the crafting itch if I didn't take a project with me. I needed something small and light. The obvious solution was something I could hand stitch. I pondered taking the half finished cross stitch projects that are tucked away in the study but they didn't appeal. For a start they were quite heavy but I really wanted something that would remind me of our holiday. It was time for me to finally try embroidery. As a complete embroidery beginner, I wanted a pretty but not too challenging design. After browsing Instagram for inspiration I chose the Cherry Blossom by Oh Sew Bootiful. I was drawn to the clean design and the modern photographic background printed onto cotton - it really helps the colours to pop. The kit contains everything you need to get going: a hoop, the design preprinted onto cotton, padding to sit behind the cotton, two needles, embroidery threads, floss to finish the hoop and a couple of instruction sheets to teach you the four stitches in this design: satin stitch, split stitch, straight stitch, and french knots. I followed the order of stitching included in the guide. I completed the flowers first starting with the darker pink as the lighter flowers should look like they are top of the darker ones. I then moved onto the buds before completing the branch. The branch is sewn using the split stitch which I found to be a lot of fun. A wonderful texture is created through the uneven stitch lengths which gives a good imitation of bark. By the end of our break I had completed the main stitching parts leaving the details on the flowers. I had tried french knots before through previous cross stitch projects but I was a little out practice. I soon remembered that I like to wind the thread around the needle a few extra times to get more definition while keeping the knots small. I also find that holding the needle just above where it will be pushed into the fabric and winding the thread there helps to avoid the knot occurring higher up the thread than you want. I tend to use my spare thumb to smooth the path of the thread until a dainty knot is formed. There is a noticeable difference between the earlier knots and the later ones as I got into the swing of them. The process of making many of them in quick succession was rather satisfying. Stitching this hoop was so much fun. While it took patience to get the stitches into the right place and become familiar with what direction they should go in, the pattern is simple enough that you can quickly see progress. It was very meditative too - distracting me from aching feet from too much walking or the face my suitcase took three days to arrive in Iceland after I did. I've yet to find a spot to hang it but I have started another pattern. It seems that I might have found another hobby to indulge. It's always a sad moment when you realise you will soon need to say goodbye to a well loved and well worn dress. About eight years ago I bought a couple of summer dresses for the office from Oasis. I still have them but only one has been consistently pulled off the rack, week after week throughout the seasons. I love this dress because of the way it makes me feel when wearing it, it's happy bright flowers backed up by a lovely shade of purple and its fit - which is pretty good for ready to wear. Recently I have been trying to find a replacement for it and have been trying on various takes on the shift dress. I couldn't find any that worked as well. I came to the conclusion that this is because most of the styles don't have much shape at the front. My dress has long French darts on the front with a bust dart. The back also features long French darts but with a small additional diagonal ones which point towards the centre back seam. The closest sewing pattern I have found to this is Tilly's Francoise but it isn't quite right for what I wanted. In the end, I traced off the dress and made it from the delightful Boca Raton in purple from Alexander Henry's Rio collection. You can read the further details including the changes I would make to the second version over on the Fabric Fox blog. A couple of weeks ago my brother departed for a break in Australia where he would met his goddaughter for the first time. Packed in his suitcase was a handmade dress for when she is a little older. Sized three months, the dress is rather adorable. After looking at a number of possible options, we selected Pupertia's Lil Critters Pinafore Dress. I was asked to recreate the sample of pale pink with the koala bear lining. Given the climate and warm temperatures throughout the year, the dress needed to be lightweight and cool. I selected a linen like cotton from Minerva Crafts in light pink for the main dress. Its just the right weight and good quality for the price. The surface is slightly textured. The koalas are designed by littlearrowdesigncompany and I purchased it from Fashion Formula on Etsy as a print on demand service. The grey is darker than I anticipated from the photo but it works very well with the pink. The print seems to have set very well and washed without any sign of fading or cracking. There’s a lot going on in this little pattern. The dress features five pockets: one on the front of the bodice, two in the front skirt and two on the back. You have the option of showing more or less of the lining on the patch pockets. As the pattern pieces were perfectly sized for a full koala head, this pinafore has the larger lining option. The skirt is gently gathered on both sides. The bodice is lined allowing for a neat finish at the waistline. This isn't as quick a make as you might imagine for something so small. While it is straightforward to put together, the number of features means there are quite a few steps. It didn't help that my overlocker got hungry and ate the front bodice as it was finishing the waistline seam leaving a hole about 10cm in length. This led to a lot of unpicking, recutting the bodice, repositioning the pocket and then gathering the skirt with a reduced seam allowance. Sigh. For the finishing touches I added grey top stitching on the pockets and added large silver grey buttons. This pattern is another solid choice for little ones from Puperita. I thrilled with how this dress turned out. I love the koala bears although I'm not sure whether they are smiling or looking a little glum! Are you able to name your most worn handmade item(s)? I've no doubt that I've said on many occasions that my latest make either is or will become mine. However, this time I feel confident in saying I have found them. A year ago I had the pleasure of testing the River pattern for Megan Nielsen and I have worn at least one of my two versions every week since finishing. When the call came out, I was initially drawn to how the pattern is reversible. It seemed great to have a item you could change up just by turning it around. Once I got my hands on the pattern I was impressed at just how versatile it was. Would I make it out of a woven or knit? Would I prefer the round or v neck at the front? Should I mix up the fabrics and choose a contrast for the raglan sleeves or add piping for definition? Do I add pockets or not? And finally, dress or top? So many options! After staring at my stash for a long time, I finally pulled out an African wax print which had been waiting to become something fun. I knew then that I would be making the dress version - I wanted to show off the print as much as possible. I went very simple in this version and changed the neckline slightly. The neckband didn't work well with the print so I switched it for a bias finish. The cotton makes for a perfect spring and summer dress. These photos are from our trip to Bruges last year where the Spring weather was stunning and I was apparently tired! When River came out for a second round of testing, we were entering autumn and I had just purchased a floral scuba from Fabworks. This time I followed the instructions for the neckband which went in perfectly to create a nice crisp v neckline. I also appreciated the other changes - the hem became a longer and felt more appropriate for the cooler weather. As with my first version, I chose to keep the make simple. The scuba is fabulous and so comfortable that it feels like I am wearing secret pyjamas during the day. This version can be very casual or dressed up a little for the office with a pair of black winter boots. The pattern has a fair amount of ease in the waist - too much for me to feel comfortable wearing the dress as it is. With both dresses, I style them with a belt which feels a little subtler than the fabric waist tie the pattern suggests. The ease is partly why I haven't yet made the top but I would probably size down for it. I'm a big fan of the depth of the hems, which is the same at the sleeves. It adds a decent amount of weight to cotton and helps it hold it shape. Another great feature of this pattern is just how easy it comes together. This is a dress you can whip up in an evening or take very, very slowly over the weekend. This pattern really is a winner and I've had to resist the urge to make a version for every day of the week! Over the past five or so weeks, I've been working on a new longer term project. The sewing course I signed up for allows you to take any project you like and steadily work through it. I chose to draft a coat which will see me through the changing seasons - the time when it's too warm for a full winter coat and too cool for a trench coat. The inspiration came from Ted Baker's Keyla coat which is a short wrap coat made from a cashmere-blend and outside of my budget! The shape is very similar to my current winter coat which I adore. The wrap over centre front combined with the high standing collar keeps out all the draughts. There is little definition in the body and it relies on the belt to provide some shape. It feels amazing to wear so a shorter version entering my wardrobe was almost an inevitability. The pattern was drafted using my standard block and the measurements of my winter coat. As a result, the design is a mix of my winter coat and the Keyla. From the Keyla, we included the darts on the side front panels, the two piece sleeve and a very similar length. The shape of the front flaps and the style of the collar at the back are from my winter coat. The toile fitted perfectly across the shoulders and waist. The length of the coat and the sleeves were also spot on. However, one change was needed at the side front. We added a centimetre or so towards the top to prevent the sleeve from pulling the side front panels therefore stopping any drag lines and allowing fuller movement. For the outer fabric, I chose a coating fabric from the new John Lewis in Oxford. It is a polyester-viscose mix which feels lovely to touch and is rather heavy. At the time of buying colour options included navy, dusty pink, light blue and black. In a rare move, I chose the black for a classic look and to ensure it will go with everything in my wardrobe. Despite it's aversion to the iron, I was able to add interfacing to the collar stand and to the front flaps. To give the collar more strength to stand upright, I used a study fusible canvas. As the front flaps need to be able to fold effortlessly I opted for a lighter fusible fleece type domette. It works perfectly with the outer fabric and gives just enough support. Thankfully, the order of construction has been pretty easy to figure out. Broadly, the front and front sides were pieced together first followed by the back and back sides. They were stitched together at the side seams and at the shoulders. The collar stand was added to the back neckline. To create the flaps, the centre back seam was stitched before being added along the front seams and the back neckline. I carefully marked the pivot point at the back neckline to ensure a smooth line at the point where the stand meets the shoulder line. This point was then carefully clipped to allow the seam allowance to lie flat. I then set the sleeves. The inside flaps were stitched to the front facing before being added to the outer shell of the coat. So far, so good and it fits very well. When trying it on, I realised that the sleeves will need some extra support and I plan to add sleeve heads. I also need to work out how I want to do up the coat before tackling the difficult task of getting all the outer seam lines to lay smooth and flat for top stitching. I'm currently debating between buttons or magnets. Has anyone ever used magnets in a make before? If so, any tips? I'm now off to start working on the lining. I'm still a little annoyed about missing out the pockets and the thought of unpicking the seams or adding belt loops are not ones that I currently cherish! How is your weekend going? I'm having a quiet one - I'll be mostly catching up with friends but I have squeezed in some sewing time to work on this scrap buster of a project. I mentioned earlier this year that I have started to attend regular weekly yoga classes. I've been enjoying it so much that I have invested in a mat. I knew that I needed a bag as it's been a little tricky carrying just a rolled mat. I almost bought one at the time I purchased the mat but realised that I had all the materials at home to make my own. This has the double win of taking out a little more fabric from the study (which I still haven't summoned the courage to sort out) and is also more sustainable than buying. This bag cost me £2 purely because I ran out of top stitching thread. Durability: I can be harsh on bags, especially when moving them from place to place, so I wanted something that could withstand this as well protect the mat. I was thinking canvas or similar. Ease of use: I wanted a bag I could just drop the mat into and go. A draw string closure made more sense than a long zip up the middle of the bag. Given my preference for the outer fabrics and that the mat is "sticky" a smooth lining would be needed to allow the mat to slide into the bag. With all this is mind, I selected a turquoise cotton canvas and some left over denim from my Miette skirt for the outer fabrics. They look rather striking together and give the durability I wanted without being too heavy. The lining is made from a black poly satin. To give the bag some more interesting features, I added a denim band to the top and added the finishing touches with some select topstitching. I'm looking forward to a more straightforward journey on Monday! I took some photos and thought I would share the my construction process in case you are interested in making your own. 1. Stitch the denim rectangle to the canvas rectangle to create the main body of the bag. Finish the seam and press down towards the denim. Topstitch into place. 2. Stitch the long sides of the body to make a tube. Finish edges and press to one side. 3. Create two button holes in the denim strip that will go at the top of the bag. As a guide, I left 3-4cm between them. 4. Finish the lower end of the strip and press up the seam allowance. Pin around the top of the bag (right side of the canvas up) and topstitch the lower seam into place. 5. To create the strap, fold the piece in half and stitch along the long edge and one short edge. Back stitch in the corner for extra strength. Finish the seam and clip the stitched corner. Turn the strap out to the right side and press flat. 6. Fix the strap in place by positioning the finished end 1.5cm underneath the denim strip. Stitch into place. You may wish to stitch this part twice for added strength. 7. Keeping the strap straight, pin the unfinished edge to the bottom of the body. 8. Pin the denim circle base to the main body and stitch into place. You may need to slightly ease the body in to fit the circle. Finish seams. 9. Create the lining by following steps 2 and 8. 10. Add the cord to the top of the bag. Insert the cord through one button hole and work around the bag keeping the cord close to the bottom between the denim and canvas until you get to the other button hole. 11. Finish the top seams of the outer bag and the lining. Insert the outer bag into the lining, right sides together. Pin around the top and stitch using a 0.5cm seam allowance. Be sure to leave a 6-10cm gap so you can turn the bag through. 12. After turning the bag right sides out, push the lining down into the outer bag keeping the top edge smooth. Carefully fold under the seam allowance where the gap is and pin into place. Topstitch along the top to keep the lining in place and seal the gap. Be sure to keep the cord out of the way so you don't catch it. 13. Give your bag a final press. Add you yoga mat, pull the drawstring to close and finish with a bow. You're now ready to go to class! A short while ago the lovely people at The Fabric Fox asked if I would join their team of creatives and I gladly accepted. For my first make I made a cute little coat for my mum' Yorkshire Terrier who has been struggling with the cold recently. Head over to The Fabric Fox's blog for full details. 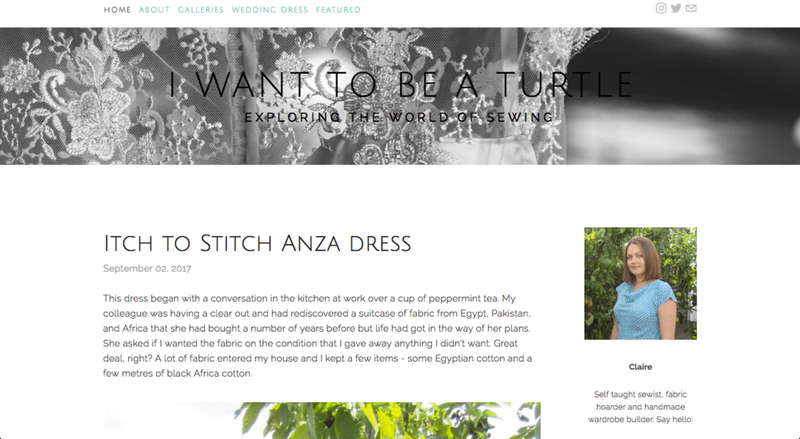 There's also a quick Q&A with me which mainly centres around sewing. This project has been a long time in the making and was my only handmade Christmas present. In the summer Frances, my Mother-in-Law, asked me to make her a bag for Christmas that could replace her preferred tote bag which was getting rather tired. The brief was simple: a tote of similar size, pockets on the inside and ideally one on the outside to hold a phone, pink polka dots, water proof (if possible) and the strap needed to be a certain length in order to hang just at the right length. I can appreciate this last point - there't nothing more annoying that walking with a bag that sits too high or too low. Feeling a little apprehensive (I don't have much experience making bags) I spent a number of weeks researching fabrics and looking for possible patterns. I drew a blank on water proof fabric. There is plenty of it available but it would either make a bag that felt like a tent or would be an incredibly boring colour. A pink polka dot exterior was not looking likely so I opted for water resistant and searched for matt oil cloth. 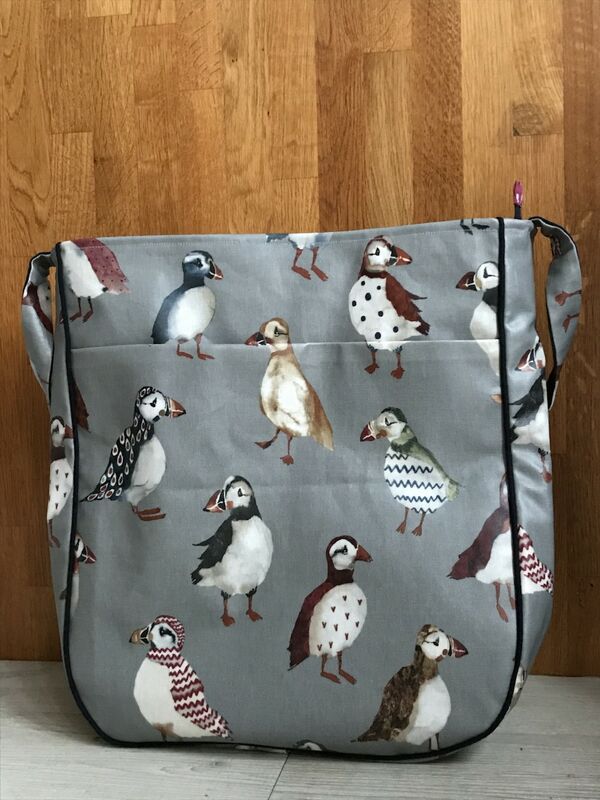 At Only Oilcloths, I came across these fabulous puffins (Frances loves puffins) and quickly placed an order. I paired it with pink polka dot cotton for the lining purchased from Minerva. While the oil cloth is rather sturdy, I added a layer of interfaced cotton canvas to add extra support. The pattern also took some time to find. Unsurprisingly there are soooo many tote bag patterns out there and many which featured most of the spec for this bag. Eventually I came across the Super Tote by noodlehead on Instagram. Described as an extra roomy tote with a front pocket, recessed zip and interior pockets, this pattern ticked all of the boxes. It seemed you could adapt it slightly and I liked many of the versions I saw. 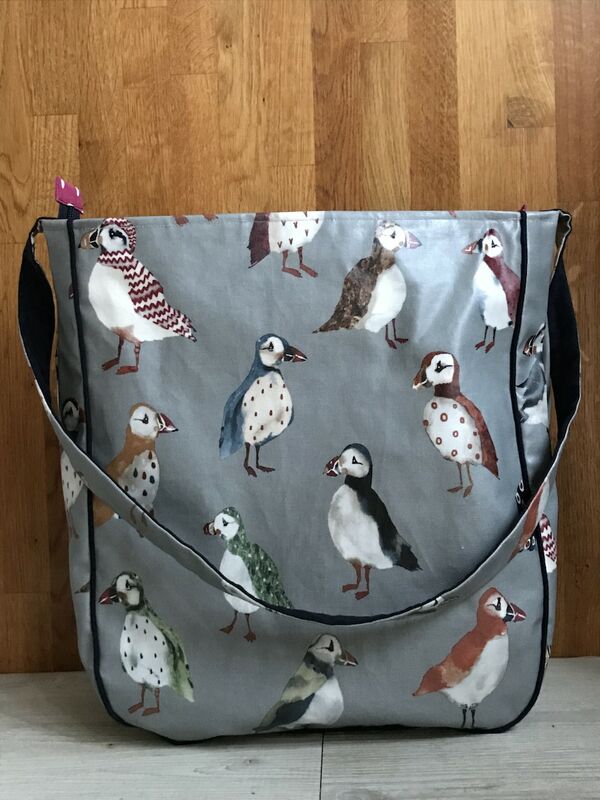 Realising that it would be impossible to cut the oilcloth without chopping a puffin in half, I made pattern matching the front pocket the top priority. The magnetic snap was added very carefully to ensure the puffins lined up as perfectly as possible. To give a sense of symmetry the gussets were cut with the same puffin at the top. Lining these pieces up it became clear that some piping was needed to allow the puffins to stand out. I made a couple of metres of narrow piping in a Robert Kauffman navy linen. I added this to the underside of the strap too. This is one detail I did change from the original pattern. Instead of two straps on the larger sides of the bag, I added a single on to the gussets. Construction was easier than I anticipated. I used wonder clips for the oil cloth and basted most of the layers well into the seam allowance as I wanted to be sure it looked as planned before stitching - a test piece proved that ripped out stitches left a permanent mark in the oil cloth. 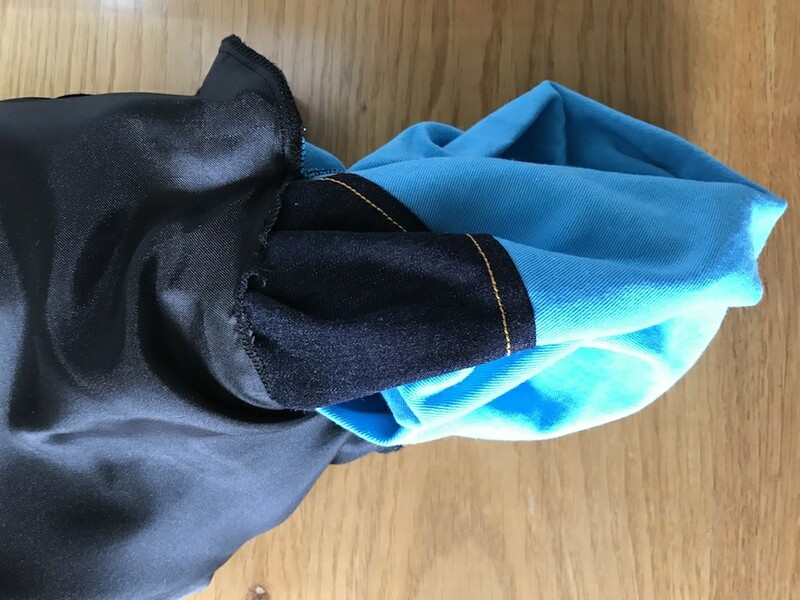 The curves at the bottom of the bag are very tricky to sew so follow the recommendation to clip the seam allowance before stitching to help it line up. Adding the interior pocket was very easy although I think I may have used a slightly too short piece of elastic as the cotton bunches a lot. It doesn't stop the pockets from being fully functional though. The one area I did struggle with was adding the recessed zip pieces to the zip as I couldn't easily get them to line up. The most scary part was the final stage - adding the top stitching around the top of the bag to keep the lining in place. It's a little off in places as the oil cloth stuck to the foot despite using tissue paper to help glide it through. I'll be giving this bag to Frances next weekend. Why next weekend when it was a Christmas present? A few days before Christmas I was finishing it up and noticed that the front of the bag had a large mark towards the top. On closer examination it appeared that the laminate from the oil cloth had been stripped off. I have no idea how this happened as the piece was fine throughout the making process. I quickly ordered another lot of oil cloth and wrapped an almost finished bag. It came home with me and I started the process of unpicking it in order to replace the front panel. Not an ideal situation and the unpicking took a long time but it was totally worth the effort. Hello everyone. How is your January going? Traditionally my most difficult month of the year, I have been surprised by how well I'm getting through it. Instead of laying under a mountain of duvets with a never ending supply of Earl Grey tea, I've been able to keep up with everything I had planned - which isn't much because overloading when you're potentially going to be feeling a little fragile is a recipe for disaster. I've been maintaining my running routine and have actually been enjoying the cold evening runs home. Another benefit has been starting yoga on a Monday evening immediately after work - such a fabulous way to begin the week. The slight downside to anticipating such an awful month is that you become super sensitive to how you are feeling. One aspect that has come into ever sharper focus for me is my ongoing lack of desire to create. Just a year ago you would find me prioritising making a dress or a free motion picture over doing the house work. Ever since finishing up the items for the wedding, I've not reached the third step of the creative ladder, let alone the normal eight or nine that I'm so familiar and much more comfortable with. A missing sewjo is fine - I've been here before and it is inevitable it will happen again but I have been surprised by one particular emotion that has come with all of this. Guilt. This is becoming the overwhelming feeling I experience when I think about sewing, when I see fabric, or go on social media and see fabulous makes in progress. This feeling is nuanced. 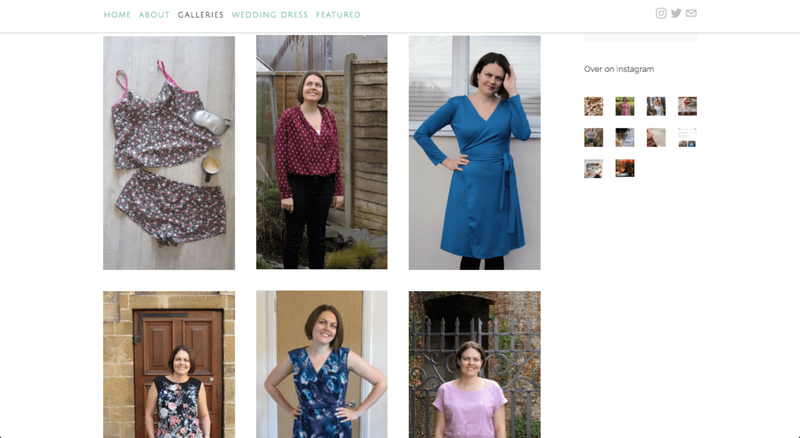 I don't feel that I owe anything to the online sewing community - we can all pick and choose how, and to what extent, we want to interact with others. Instead I feel awful that I am not joining in, not sharing because I am not making. I'm now struggling to sit on the sidelines and cheer you all on because it opens the wound of not making a little wider every time I do. I'm avoiding our study where my sewing supplies are kept. The room is in an absolute mess and needs to be tidied but the stab of guilt of looking at my stash and all my scraps sends me dashing for the sofa and the safety of a fiction book. Interestingly, it isn't true to say that I'm not making. I've made a number of items for others and myself over the past three months, all which had deadlines. Getting round to making them has been challenging but I've enjoyed the short bursts of stitching - the 30-60 minutes I can muster. Guilt raises it head when I struggle to get going and walk away from the table. It's also present when I think about how I want to share these items with you, to commit to the web the blog posts that have been circulating in my head for months, and yet even that seems a step too far. I have no doubt that this will eventually pass. That I will find myself spending a weekend in the study rolling fabrics and putting patterns away. That I will find myself glued to my machine making all the things because the urge to stitch is overwhelming. In the meantime, I'm trying to keep the pressure off and see if I can nudge myself to a sturdier footing on the third step of the ladder. This post appears to have come from the decision to not force a post. I start a sewing course on Wednesday where the plan is to draft and stitch a jacket that will get me through the changing seasons. There is some gorgeous wool in John Lewis that is calling to be bought with my birthday money and I have some delicious silk from Vietnam that could work for the lining. The plan is there and with the accountability of the course I'm hopeful. Let's see if it works. The Refashioners inspire me every year but this is the first time I have actively decided to join in. It can't be that difficult I thought. Just take a suit jacket, add a few well placed darts, perhaps remove the sleeves or alter the collar and suddenly the jacket will be transformed. Not quite. It appears that I have difficulty seeing a completed item, imaging what it will become and then working out how to get there. Taking the jacket completely apart and eeking a pattern out of it in a game of Tetris seemed less hassle and I ended up doing that twice. Today I'm sharing the more complicated make but check back at the weekend for the other (or Instagram tomorrow). I'm slightly freaked by how my hair looks in these photos. In real life it is much more blonde and gold than orange! 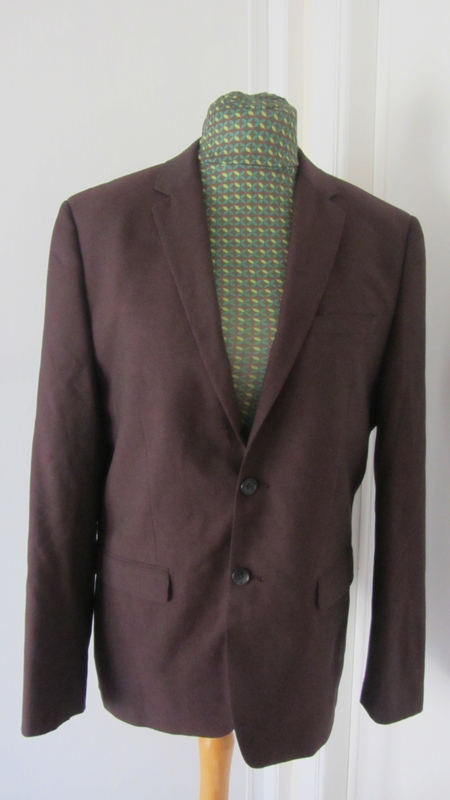 This item started life as mens size 40R jacket from Next which I picked up for £5.99 in one of the local charity shops. The colour caught my eye - I have nothing against the traditional suit colours but I'm not well know for wearing black, brown, navy or pin stripes. I immediately thought of a waistcoat/jumper to wear over a white shirt during the cold months but it had to have an interesting twist. I turned to Simplicity 2442 - the neckline of which I adore. I won't go into too much construction detail as you can ready about that in my previous posts (here and here) To make the most of the fabric, and for style, I moved the zip to the side and used the original centre back seam of the jacket. The sleeves and front of the bodice also came from the body of the jacket. To give a nod to its origin I included the breast pocket in the front of the left sleeve. The middle band and lower bands came from the sleeves. The bodice is fully lined from the original lining and has a patchwork effect as embracing the navy sleeves and grey body lining. The grey lining is a little delicate and I'm not sure how long it will last. The label says it is 100% polyester and I tend to find ready to wear linings don't last as long as you would hope. Overall I'm really pleased with how this top has come out and its construction. The insides are nice and tidy - have you spotted the matching bias binding to finish the sleeves neatly? I had some doubts about how the shaped neckline would work with a collared shirt but I think it works rather well. I can see this working with smarter trousers for a more formal look. The outer fabric is a poly viscose mix and has a much more structured look and feel the poly viscose mix that I imagined but I think that adds to the charm of the style. I do have one issue with it though, and it is a big one. It seems that I messed up on the drafting of the bottom band and it is very tight - like unable to eat when wearing tight. I cut the bottom band on the cross grain which seemed to have a little more stretch but forgot to shape out the side seams enough to accommodate my curves. You can see how tight it is pulling in the back photo. The fit of the rest of the top is snug but not suffocating like the bottom band. I'm not sure there is a quick fix to this but I would like to find a way to fix it as I would love to wear my new creation as originally intended. If you have any suggestions, please let me know. It would be a shame to let this make just hang about unloved. Have you heard there's a new pattern company on the scene? 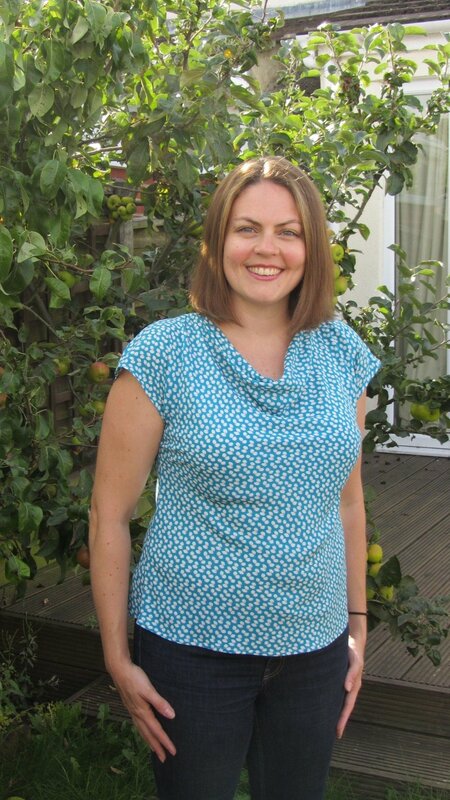 The lovely Jodie today launched the first pattern from Octavia Patterns. Octavia focuses on more modern styles and fashionable designs aimed at the workplace or for those wanting something different to the vast range of vintage inspired patterns we see so often. You could say they are more like what you will find in shops and the hope is the designs will be ones that will stick around for years rather than weeks. The first pattern is Pomegranate - a fabulous cowl neck blouse with short kimono sleeves. I was fortunate enough to pattern test this little beauty. I'm a sucker for a cowl neck blouse especially when paired a black skirt for the office or a pair of jeans for a night in the local pub. Throw in kimono sleeves, no closures or darts, and the knowledge I can make this in an afternoon and you could safely bet that I would be hooked. Pomegranate is very easy to make but you do need to take care during construction. As you might expect, it is cut on the bias so careful handling is a must to ensure you keep the shape and prevent a stretched neckline. That said, you can still whip this up quickly and if you're not sure about how to sew on the bias check out the blog section of Octavia's website where you will find some handy tips. The back neckline is finished with a bias facing and the cowl by folding the raw edge twice and stitching into place. This is about as fiddly as the construction gets. For fit, I did make a few changes - namely grading between sizes and also lengthening the waist by 1.5cm as I like my tops to be a little longer. 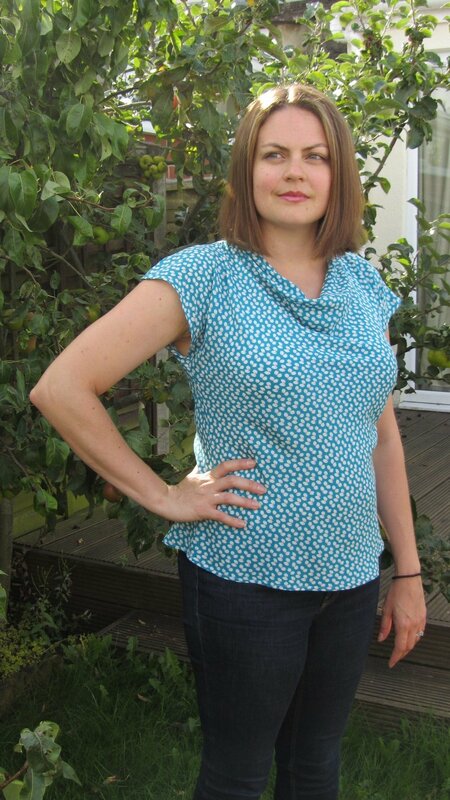 Having worn this top a fair amount there is one more change I would make to my next version which is to add more width to the back - the side seams sit a little further back than normal for me. It doesn't take away from the comfort of the top but it is something I am aware of. This version is made from some delightful viscose from Sew Over It. It has a close enough weave to give a wonderful drape while keeping the cowl in place. My original version was in a poly satin which has a much looser weave and gave a much deeper cowl as well as some weird drag lines across my bust. The moral of this tale is to think carefully about what fabric you use - the poly satin version is still on my dress form wondering if it will ever be hemmed and worn. I doubt it will be unfortunately. In the meantime I will overwear this version - it works perfectly for the office or with a pair jeans for a lazy weekend or dinner out. If you want to make your own version be sure to snap up the pattern this week as you'll get 20% off. I doubt you will regret it. As a pattern tester, I received the final version of the pattern and I was under no obligation to post. 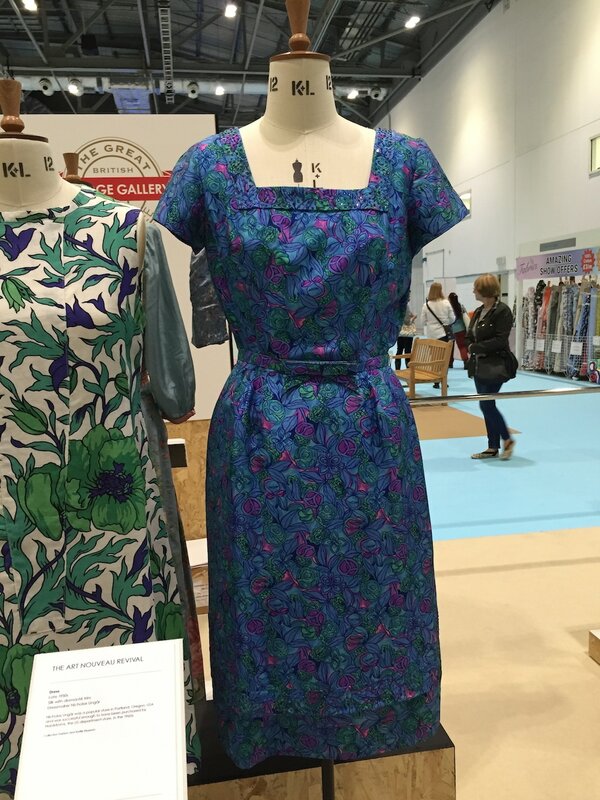 On Friday I had a fabulous day out at the Great British Sewing Bee Live. I went with the intention of trying to see everything, to chat to fellow sewists, and to come home with limited fabric purchases. Arriving on time with Hannah, we decided to start with browsing some of the shops. There was everything on offer and I found it a little overwhelming to decide what to buy. All our favourite shops were there as well as some that were new to me. It would have been so easy to drain my bank account and come away with metres and metres of fabric as nearly all the stalls were related to dressmaking unlike many of these big shows. As I haven't been sewing much from my stash, I didn't feel I could justify buying without a plan so focussed on what I didn't have but needed. In the end I limited myself to two purchases. I picked six fat quarters from Fabrics Galore for some Christmas stockings I making for a charity sale. The other purchase two metres of some absolutely delicious wool blend from Fabworks for a pair of trousers. We attended the Super Theatre were it was great to see the alteration challenge live. Refashioning items is not a strength of mine and I found it very impressive to see three shirts transformed into girls dresses in just 45 minutes. I also really enjoyed browsing the Liberty exhibition which featured clothing from across the decades. I spent ages looking at the many details in each piece and seeing how they showed off the fabulous prints. One aspect of the event that appealed to me was the workshops and I managed to attend one. The aim was to make a faux suede or leather clutch bag in an hour. I chose this one as I hadn't worked with either of these fabrics before and thought it would be a good introduction. All materials were provided and pre cut to save time and an instruction sheet was also provided. The process for making the bag was simple and quick - fold under the lining seam allowances and place over the leather, stitch along the bottom seam, add the snap, fold up the bottom of the bag and stitch from the bottom of one side all the way around the point to the other side. While it was a quick make and the instructor was clear and supportive, I felt that the session was too rushed and there was pressure for the participants to keep up at a speed that some clearly weren't comfortable with. I came away with a finished bag but it isn't one that I will be using as it isn't finished very well - my snap is off centre, the lining is peaking out the sides and my stitching is very uneven. However, it was a good introduction to working with faux leather and I learnt some useful tips during the hour. I'm also likely to unpick the bag and use it as a pattern to make another but with a longer time allowance. The size of the bag is very good and could be used for a number of purposes - a night out or holding documents. As if all this wasn't enough, I managed to catch up with a number of familiar faces over lunch and became a Love Sewing Magazine Cover Star - such a fun addition to their stand. GBSB Live have just announced the dates for the next show - 8-10 June 2018. I've already popped the dates in my diary and started a little savings pot so I can take more advantage of what is on offer! This morning I want to introduce my blog makeover! For a fair few months (read at least a year), I have longed for a much fresher and more modern looking blog but have struggled to make blogger work in the way I wanted. Then the site started to mess around with my photos for reasons I couldn't work out and I decided the time was right to make a move. So here we are! A new look which is optimised for all devices. While a lot has changed, you'll find everything here that was available in the previous format and I've kept the same fonts and some colours. Many pages have been tidied up and refreshed to have more relevant content. The navigation bar is now at the very top. You'll find the search and archive options in the side bar as well as a sneak peak at my Instagram feed. It was a little hard to say goodbye to the turtle that my brother designed a few years ago but I think this new design represents where I've got to now. I hope you enjoy having a mooch around and do let me know what you think. This is my first time designing a site from scratch (luckily without needing to know any code!) and reformatting everything so I would also like to know if you encounter any broken links or photos that don't load. I think I have caught them all but you never know when dealing with over 200 posts! 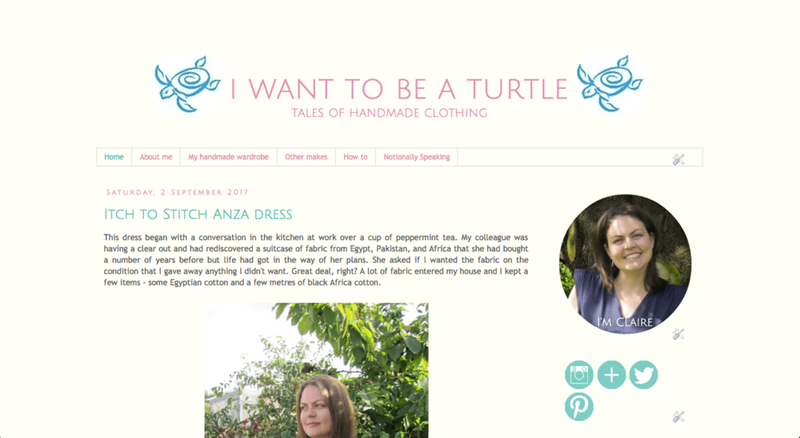 A creative lifestyle blog which mainly focuses on my personal sewing, drawing and thread painting projects. You're almost done. Please be sure to click on the link in the verification email sent to you to ensure you receive the new posts.